- Max. extension: 39.5" from wall to VESA monitor mounting plate. - Min. 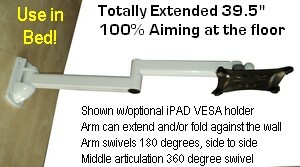 Length (100% against wall): 5.5"
- Weight capacity: 26 lbs. 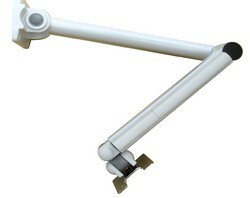 * Extra Long LCD Heavy-Duty Monitor wall arm: this solid 100% steel folding flat panel arm extends from 5.5" to 39.5". This extra long LCD wall arm has unlimited viewing possibilities: the monitor can face almost anywhere. The LCD bracket tilts 90 degrees up or down, swivels 90 degrees to each side and rotates 360 degrees. It can face 100% straight down to the bed and to any wall. 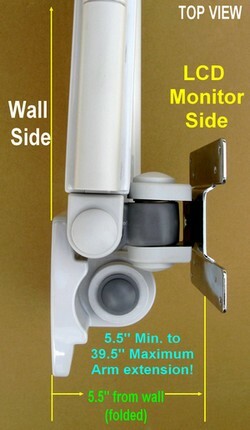 Very practical for viewing a monitor in bed: the arm can be installed on a side wall or on the headboard wall. The screen can also be viewed in landscape or portrait mode. * Multiple adjustable articulations: the above movements are possible due to its multiple articulations. * Torque adjustment: the smoothness of all the articulations can be adjusted. * Cable Management: concealed through the arm's cable-conduits. * Optional D-REF Installation Reinforcement Plate (D-REF): to ensure a sturdier installation, especially on hollow walls or weak walls. Buy D-REF Reinforcement plate. 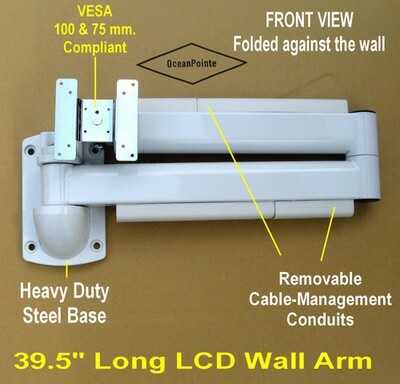 * Need a longer over-the-bed Monitor Wall Arm? 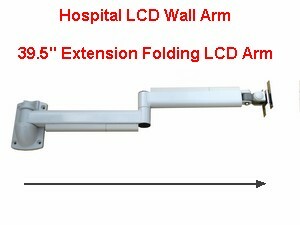 For an 63" reach vs this 39.5" verson, please see our New DW630W Hospital Over-bed Wall Monitor Arm.